Huge metal roosters are all the rage, and our newest Giant Iron Rooster in standard classic color is currently our largest addition creating much of the chatter! 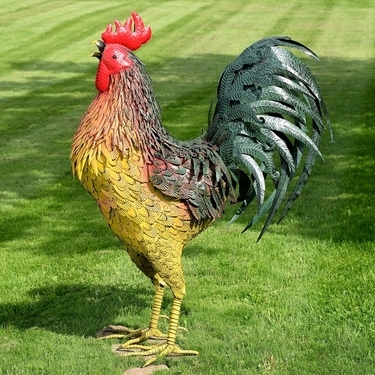 This spectacular metal rooster is skillfully crafted one feather at a time from colorful powder coated iron. Standing nearly six feet tall he is an ideal piece for your lawn, garden, or even store front. Built for long-lasting durable indoor and outdoor use, this rooster is sure to catch eyes no matter the setting! You can't miss him! Ships by Freight Truck. Call for added discount on 2 or more birds.